Три использования подчиняющего разум дает преимущество перед одним использованием исчадья тьмы: ~ +260% урона, +80% регена маны. восстанавливет 1.3% от 300.000 маны - это 3900 маны за удар, а сколько он в среднем их делает? Владельцы Кри'так, императорский скипетр роя, будут созерцать у себя в услужении мини-Ша. 1 момент - звурушка регенит за 15 секунд своего существования не 39000 маны, а немного больше (в среднем 45000). Иногда регенило и больше 50-ти тысяч. Может быть, зависит от рейтинга скорости самого приста, но не уверен. 2 момент - для ДЦ пристов, которые специализируются на Искупление вины, данный талант не будет представлять никакой ценности. За 3 минуты, на фоне таланта , потеря маны, в среднем, составит 37000. На данный момент потенциально восстанавливает 4% маны в минуту. Isn't this just another Shadowfiend? Also, unless the damage it deals is significant, wouldn't this be a pretty useless talent for Shadow? EDIT: OK, the tooltip didn't indicate if this replaces Shadowfiend or not. I guess it does in which case it makes sense as a talent. We don't dominate, we don't read, we don't straighten, we don't break, we BEND the mind. Need an improved shadowfiend? Why not Zoidberg? Actually this is pretty amazing. No more dps loss or mana starved just because your shadow fiend fell to its own death! Hope it works with Glyph of small fiend as well. The Mindbender will attack 11 times regening 1,461 mana per hit for a total of 16,071. Mindbender has 1 min cooldown. The Mindbender will attack 11 times regening 1,461 mana per hit for a total of 16,071. I post this information from the point of view of a Holy Priest (or Disc Priest) concerned only with the mana regen aspect it. The Mindbender is basically an upgrade to the Исчадие Тьмы, offering superior damage output and a valuable source of mana regeneration. It actually deals less damage per hit than the Shadowfiend, but lasts longer and can be summoned three times as often. It is a Tier 3 talent, the other options being Пробуждение Света/Наступление Тьмы and Слово силы: Утешение/. The Mindbender therefore has the potential to outperform the Shadowfiend considerably. However, this relies on the priest to make the most of its short cooldown. Additionally, it requires the priest to spend a global once per minute summoning the Mindbender (rather than once every three minutes) which is potentially a downside. Other upsides include having the pet active more often, when can help to distract or confuse enemies, and reduces the impact of having your pet CCed, since its time is less precious. The Mindbender has a default attack speed of 1.5 seconds, but does benefit from haste, granting extra hits and thereby increasing damage and mana generation. With 0 haste, the Mindbender should therefore deal 13 attacks per summon. Mindbender now lasts 20 seconds, up from 15. This makes it a more powerful upgrade, and allows it to deal more damage and regenerate more damage per summon. This should also make it a slightly more competitive talent option, improving its overall function by 1/3. Mindbender's mana regeneration has been reduced from 1.75% per hit to 0.75%. More critically though, Исчадие Тьмы no longer regenerates mana. This means Mindbender's mana regeneration is no longer in competition with the Shadowfiend, only with the other Tier 3 talents. Mindbender does a good job regenerating your mana. Since Mindbender's lower mana regeneration per hit compared to the standard Shadowfiend is compensated for by its longer uptime and shorter cooldown, you should almost always keep Mindbender on cooldown to maximise the benefit. This lil mindbender, also makes the cutest of noises when attacking too.. kinda haunting screeching sounds but cute none the less! For easier content, PW:Solace is actually better than Mindbender. Personally i love PW:Solace, but at times in progression, there just isn't enough time gap to cast an equavalent amount of PW:Solace to make it on par with MB. 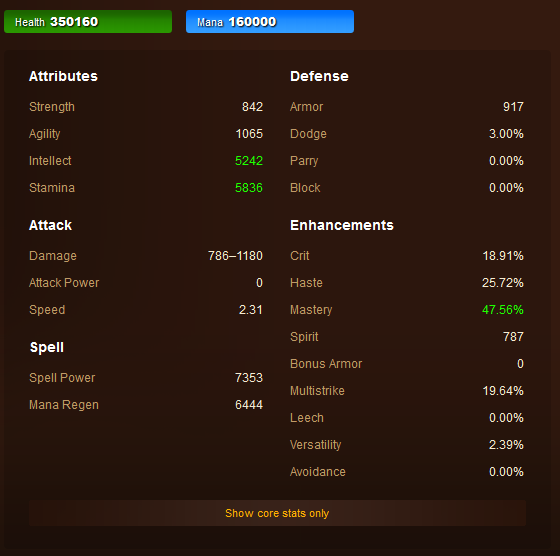 Would love to see perhaps a lil increment of mana regen from PW: Solace, perhaps make it 0.9% or so. Currently seems to restore ~1.46% mana per attack (tested at level 87; 2336-37 mana per hit, 160k mana pool). If you have Кри'так, императорский скипетр роя or Цзинь'я, сфера говорящего с водой equipped, this spell will morph into Подчинитель разума, which looks like a little sha. I had been wondering what was causing it, but it looks as if when you have a sha touched weapon equipped when casting this, the mindbender is morphed into one of those black and white sha creatures, the ones about the size of a shadow fiend, the kind that can pop up when doing archeology. I was asked if this talent replaced shadowfiend, and I replied with this. It devours its soul, then it wears its skin. Its got such a charming evil grin. unless it is your demise you seek. I gotta say, this thing is really broken considering it has -INSANE- damage reduction for whatever reason. I've got my set of S12 epic and a S12 weapon and was only hitting this damn thing for 8k with Slam. In comparison to Power Word: Solace, which spell gives more mana overall? I recently switched from Holy to Disc and I'm not sure which mana regen. spell to take since Disc needs to deal some damage for Archangel. With the Tier 18 Shadowpriest 2-set bonus, the cooldown of mind bender is reduced by 40 seconds. This means that with the 2-set, it is possible to have the mind bender up for entire fights. Of course, this replaces insanity, but judging by my personal simcraft evaluations, the difference of dps for both of these specs is around ~1.3k dps. Results are sampled at an ilvl of 703 equipped with the following stats. In legion will the damage of this pet heal through atonement? Вы призываете подчинителя разума, который атакует цель в течение 12 sec. Каждая его атака восполняет вам 0.5% от максимального запаса маны.